For one set, Nicole Gibbs was brilliant. The former Stanford star was scurrying around the court, even though her left thigh was wrapped, and lacing passing shots against the top-ranked player in the world. It didn't last, as Karolina Pliskova rallied for a 2-6, 6-3, 6-4 victory over the American qualifier today in the second round of the U.S. Open in Flushing Meadows, N.Y. The turning point in the daytime match at Arthur Ashe Stadium came when Pliskova broke serve at love to lead 4-3 in the second set. Pliskova, a 6-foot-1 (1.86-meter) Czech, won all 17 points on her first serve in the third set. Gibbs, a 5-foot-6 (1.68-meter) resident of Santa Monica in the Los Angeles area, had 14 winners and only four errors in the first set but finished with 32 and 28, respectively. She had lost to Pliskova 6-0, 6-0 in their previous meeting in the second round at Sydney in 2015. Pliskova avoided joining the list of upset victims in the U.S. Open. Through two rounds, five of the top eight seeds have been eliminated: No. 2 Simona Halep, No. 5 and two-time runner-up Caroline Wozniacki, No. 6 and defending champion Angelique Kerber, No. 7 Johanna Konta, and No. 8 and 2004 champion Svetlana Kuznetsova. Gibbs won three NCAA individual titles in her three years at Stanford. She had two in singles (2012 and 2013) and one in doubles (2012), and added one NCAA team championship (2013). Two other ex-Stanford standouts, Bob and Mike Bryan, got off to a good start as they try to end their three-year Grand Slam title drought in men's doubles. The fifth-seeded Bryan twins, 39, defeated Czechs Roman Jebavy and Jiri Vesely 6-2, 4-6, 6-3. The Bryans have won a record 16 Grand Slam men's doubles titles, including five in the U.S. Open. Their last major crown came in 2014 in Flushing Meadows. Rohan Bopanna, India, and Pablo Cuevas (10), Uruguay, def. Bradley Klahn (Stanford 2009-12) and Scott Lipsky (Stanford, 2000-03), United States, 1-6, 6-3, 6-4. Raquel Atawo (born in Fresno; Cal, 2001-04; San Jose resident), United States, and Sabine Lisicki, Germany, def. Nicole Melichar, United States, and Anna Smith, Great Britain, 3-6, 7-5, 6-3. Nadiia Kichenok, Ukraine, and Anastasia Rodionova, Australia, def. CiCi Bellis (born and raised in San Francisco Bay Area), United States, and Marketa Vondrousova, Czech Republic, 6-3, 6-4. Raquel Atawo (born in Fresno; Cal, 2001-04; San Jose resident), United States, and Aisam-Ul-Haq Quereshi, Pakistan, def. Louisa Chirico and Bradley Klahn (Stanford 2009-12), United States, 6-4, 6-4. Maria Jose Martinez Sanchez, Spain, and Nicholas Monroe, United States, def. Kristie Ahn (Stanford, 2011-14), and Tennys Sandgren, United States, 6-4, 6-2. The U.S. Open has been the scene of some of CiCi Bellis' greatest triumphs. Today, it was the scene of one of her most disappointing losses. Bellis, who was born in San Francisco and grew up in nearby Atherton, fell to Nao Hibino of Japan 6-3, 4-6, 7-5 in Flushing Meadows, N.Y., in a first-round match postponed by rain. Bellis, 18, led 5-3 in the third set but collapsed in a blaze of unforced errors, especially on the forehand side. She was clearly perturbed afterward, giving the 22-year-old Hibino a perfunctory handshake at the net. Bellis, the youngest player in the top 50 at No. 36, will drop to about No. 43 after the U.S. Open. She reached the third round as a qualifier last year, then turned pro. Three years ago, Bellis stunned 12th-seeded Dominika Cibulkova in the opening round to become the youngest player to win a singles match at the U.S. Open since Anna Kournikova, also 15, in 1996. Cibulkova had advanced to the Australian Open final that year. Hibino, ranked No. 80, earned her first main-draw victory in a Grand Slam tournament after seven losses and topped Bellis for the first time after two defeats. Hibino won the inaugural Stockton Challenger in 2015. Meanwhile, Sloane Stephens, a 24-year-old Fresno product, upset No. 11 seed Cibulkova 6-2, 5-7, 6-3 in the second round. Stephens, who climbed to No. 11 in the world in 2013, returned to competition last month at Wimbledon after missing 11 months because of foot surgery. She will play Ashleigh Barty of Australia. Ex-Stanford star Nicole Gibbs beat Veronica Cepede Royg of Paraguay 6-0, 1-6, 6-1 in the completion of a first-round match suspended by rain. Gibbs, 24, will face top-ranked Karolina Pliskova of the Czech Republic. Sofia Kenin, who won last month's Stockton Challenger, topped qualifier Sachia Vickery 6-3, 4-6, 7-6 (0) in a second-round matchup of Miami-area residents who often practice with each other. Kenin, 18, was born in Moscow and moved to the United States as a baby. She will take on her idol, wild card Maria Sharapova. If Kenin loses and remains an amateur, she will forfeit $144,000 for reaching the third round of the U.S. Open. On the men's side, No. 17 seed Sam Querrey, a 29-year-old San Francisco native, beat 32-year-old Dudi Sela of Israel 6-4, 6-1, 6-4 in the second round. Querrey, 6-foot-6 (1.98 meters) and 210 pounds (95 kilograms), is 9 inches (22.9 centimeters) taller and 66 pounds (30.0 kilograms) heavier than Sela. Querrey, who reached his first Grand Slam semifinal at Wimbledon, has not lost a set in two matches at the U.S. Open. He will meet another 5-foot-9 (1.75-meter) veteran, 27-year-old Radu Albot of Moldova, and could face Davis Cup teammate John Isner, seeded 10th, in the round of 16. Two champions of the Bank of the West Classic at Stanford played today in first round of the U.S. Open. No. 6 seed Angelique Kerber, the defending champion at Flushing Meadows, lost to Naomi Osaka, 19, of Japan 6-3, 6-1 during the day session at Arthur Ashe Stadium in New York. Kerber won the 2015 Bank of the West. It was Osaka's first top-10 victory and the first time the defending champion lost in the first round of the U.S. Open since Svetlana Kuznetsova in 2005. No. 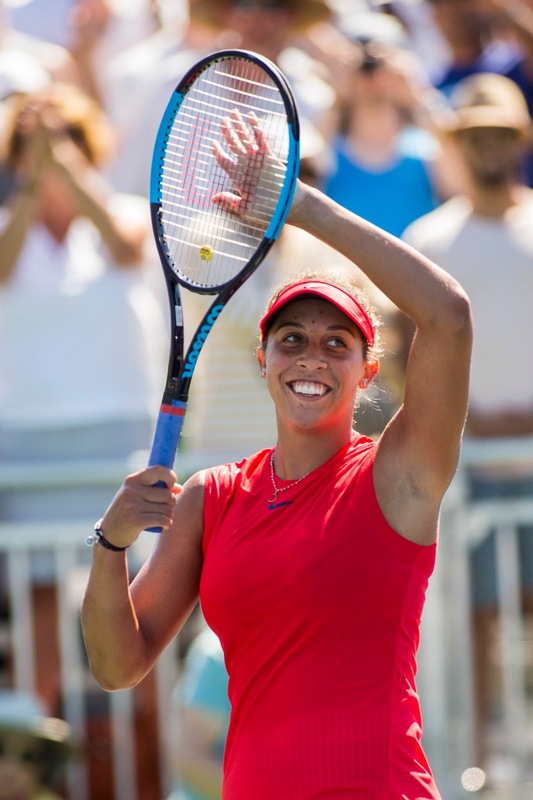 15 seed Madison Keys, who won last month's Bank of the West Classic, opened the evening session with a 6-3, 7-6 (6) victory over Elise Mertens of Belgium at Ashe. 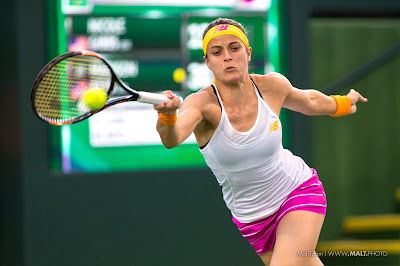 Ex-Stanford star Nicole Gibbs leads Veronica Cepede Royg of Paraguay 6-0, 1-6, 1-0 in a match suspended by rain. The contest is scheduled to resume on Wednesday at 8 a.m. PDT. Partly cloudy weather with only a 10 percent chance of rain is forecast. Ashe is the only stadium at the USTA Billie Jean King Tennis Center with a roof. Cepede Royg, 25, is ranked No. 75, and Gibbs, a 24-year-old Southern Californian, is No. 127. But Gibbs won their only previous meeting, 6-3, 6-2 in the second round at Carlsbad, Calif., in 2015 on a hardcourt. Both players are undersized, Gibbs at 5-foot-6 (1.68 meters) and Cepede Royg at 5-foot-4 (1.63). The winner will face top-ranked Karolina Pliskova, who outclassed Magda Linette of Poland 6-2, 6-1. CiCi Bellis' first-round match against Nao Hibino of Japan was pushed back to Wednesday after the 8 a.m. match between No. 18 seed Gael Monfils and fellow Frenchman Jeremy Chardy on Court 17. Bellis, who grew up a five-minute drive from Stanford in Atherton, is 2-0 against Hibino, who won the inaugural Stockton Challenger in 2015. Bellis, 18, is the youngest player in the top 50 at No. 36. Hibino, 22, is ranked No. 80. --No. 17 seed Sam Querrey, a 29-year-old San Francisco native, will meet diminutive Dudi Sela (5-foot-9 or 1.75 meters and 144 pounds or 65 kilograms) of Israel. --Sloane Stephens, a 24-year-old Fresno product, will take on No. 11 seed Dominika Cibulkova of Slovakia. --Sofia Kenin, who won last month's Stockton Challenger, will play qualifier Sachia Vickery in a matchup of Miami-area residents. Kenin, 18, ousted No. 32 seed Lauren Davis of Orlando, Fla., in the first round. Sam Querrey could go far in the U.S. Open. With his confidence at an all-time high, the 29-year-old San Francisco native opened with a 6-4, 6-3, 6-4 victory over Gilles Simon, a former top-10 player from France, today at Flushing Meadows. The 6-foot-6 (1.98-meter) Querrey, coming off his first Grand Slam semifinal last month at Wimbledon, fired 10 aces in the 1-hour, 52-minute match. "I thought I did everything pretty well," the 17th-seeded Querrey, who now lives in Santa Monica in the Los Angeles area. told reporters. "The best thing I thought I did well was not get too down on myself. I lost serve three or four times in a row at one point, which doesn't happen too often. I did a good job of battling through that. Every part of my game felt good today, so overall I was pretty happy." Simon, 32, ascended to a career-high No. 6 in 2009. Both Querrey, ranked No. 21, and Simon, ranked No. 39, have reached the round of 16 in the U.S. Open twice. Querrey will face another 32-year-old veteran, Dudi Sela of Israel, in the second round on Wednesday. Sela, only 5-foot-9 (1.75 meters) and 144 pounds (65 kilograms), dismissed U.S. wild card Christopher Eubanks 6-2, 6-4, 6-2. Querrey leads Sela 3-2 in their head-to-head series. Querrey could face 10th-seeeded John Isner, 6-foot-10 (2.08 meters), in an all-American showdown in the round of 16. Querrey is 4-2 against Isner. Earlier today, Dmitry Tursunov lost to qualifier Cameron Norrie 7-6 (7), 6-1, retired. Tursunov, a 34-year-old Russian who owns a townhouse in the Sacramento suburb of Folsom, had his right knee taped during the match. Norrie, a 22-year-old left-hander, was born in South Africa, grew up in New Zealand, starred at Texas Christian University in Fort Worth, still lives there, and plays for Great Britain. On the women's side, Sloane Stephens beat 2015 U.S. Open runner-up Roberta Vinci of Italy 7-5, 6-1 for her first victory at Flushing Meadows in three years. Stephens, a 24-year-old Fresno product, won eight of the last nine games. Stephens missed last year's U.S. Open with a foot injury and lost in the first round in 2015. The former world No. 11 had foot surgery and missed 11 months. She returned at Wimbledon, then reached the semifinals in Toronto and Cincinnati. Two years ago in the U.S. Open, Vinci pulled off one of the biggest upsets in sports history when she ended Serena Williams' bid for the first calendar-year Grand Slam since Steffi Graf's in 1988. The unseeded Vinci, playing in her first major semifinal at age 32, shocked the top-ranked Williams 2-6, 6-4, 6-4. Stephens, a semifinalist in the 2013 Australian Open (beating Williams), will face No. 11 seed Dominika Cibulkova in the second round. Sofia Kenin, who won the $60,000 Stockton (Calif.) Challenger last month, stunned No. 32 seed and fellow American Lauren Davis 7-5, 7-5 for her first Grand Slam victory. Kenin, 18, trailed 4-0 in the first set. If Kenin remains an amateur, she will forfeit $86,000 for reaching the second round and at least $144,000 if she beats qualifier Sachia Vickery on Wednesday. Kenin and Vickery, 22, live five minutes from each other in the Miami area and "practice (together) almost every single day," Vickery said. The winner could take on wild card Maria Sharapova, who ousted No. 2 seed Simona Halep 6-4, 4-6, 6-3. Russia has been in the news a lot lately. The nation almost was banned from last summer's Olympics in Rio de Janeiro because of doping. In the end, 270 of its athletes were cleared and 167 dismissed. Former world No. 1 Maria Sharapova returned from a 15-month doping suspension in April. And former FBI director Robert Mueller is heading an investigation into alleged Russian interference in last year's U.S. presidential election. Former top-20 player Dmitry Tursunov discussed these issues -- as well as Donald Trump, Vladimir Putin, politics, favorite cultures and global warming -- during the recent $100,000 Nordic Naturals Challenger in Aptos, Calif.
Tursunov, a 34-year-old Russian, moved to the San Francisco Bay Area at 12 to train and turned pro at 17. He owns a townhouse in the Sacramento suburb of Folsom but is based in his hometown of Moscow. Tursunov is scheduled to play British qualifier Cameron Norrie in the first round of the U.S. Open on Monday at 8 a.m. PDT on Court 14. It will be Tursunov's first appearance at Flushing Meadows since 2014, when he lost in the opening round to Alejandro Gonzalez of Colombia. Tursunov has reached the third round of the U.S. Open four times. Why has Russia had such a doping problem in Olympic sports? I think they wanted to win that way (laughs). I wouldn't be able to answer that question. There are a lot of theories. I believe that none of these high results can be achieved on Flintstones (vitamins). This is so far beyond what people can buy at the store. All the athletes are basically guinea pigs for all the stuff you end up buying at GNC later -- creatine powders, protein powders. Anything you buy at GNC had to be tested somewhere, and it's tested on athletes. I think there are basically two entities working. One is trying to develop something that helps you perform better, and the other is trying to keep up with the first one and trying to figure out, OK, this is helping you perform better, so this is considered doping. I'm taking some protein shake, and I already feel nervous because anything you take, it's your responsibility. It doesn't matter where you buy it; it doesn't matter if the package doesn't say it contains something forbidden. We do get some warnings about eating in China and Mexico because steroids from the meat can get in your bloodstream. It's a tough situation because you can't perform eating Flintstones or One-A-Day Centrum. If you think about it, you're a race car that you're supposed to drive on street tires from Big O. You have to treat professional athletes like a race car. Don't expect it to be running on the same type of gas and using the same type of oil and tires or have anything similar to a regular car. You have to try to find advantages and improvements all over the place in order to perform better. I'm pretty far from politics, but Donald seems like not the guy you want to be friends with. He's a pretty tough, abrasive guy. I think he's fairly obnoxious. How many people would say he's a guy they would like to have a drink with or have a round of golf with? He's like the kid who would take the other kid's lunch money. But I also feel like he's getting so much criticism for everything. OK, he's doing some stupid s--- here and there, but even if he decides something good, people aren't going to let him do it because they're so busy criticizing him. If he's so bad, how did he end up being a candidate for president? That's puzzling to me. ... People should have been worried (about him) a long time ago, not whine and cry about it now. ... Impeach him or let him do something. ... People are fighting him tooth and nail. It's kind of sad to watch. If you could have voted in last year's U.S. presidential election, would you have, and if so, for whom? So you don't vote in Russian elections? No. As much as people say voting matters, I don't think it truly does. I think most people vote without a true understanding of what they're voting for. We don't have enough information to make a qualified decision. We have to study it and analyze it. Reading media is not necessarily a good thing. Listening to a couple of (debates) ... they all have their points written out for them. They're going to point a finger and say, "Oh, yeah, but you smoked weed in college, so you wouldn't be a good president. What you got to say about that?" It's all a bunch of noise. I don't really believe in that. We're too consumed with looking at others instead of looking at ourselves. The world would be a much better place if each person woke up in the morning and said, How can I today be better? Instead, we say, "Donald Trump wants to build a wall. Oh my god. What a terrible president. I can't believe the damn Russians. They gave us Donald Trump for president." It's not very productive. I think he's doing what's best for his country, whether other people like it or not. Just like Donald Trump is going to do what's better for his country. I don't know (Putin) personally, but the public perception is he's a pretty tough guy. Some people say he's a dictator; some people say he's the best president for Russia. I don't know. I guess we'll find out in time. Honestly, I'm not the most educated person to make a qualified assessment of whether he's a good or bad president. Who am I to say Donald Trump is a bad president? A lot of people say, "He's a horrible president." OK, if you were president, would you do a better job? When I play tennis, there are 200 coaches out there saying what I should be doing different, but somehow they're not better players. It's very easy to look at it from the sideline and say, "This guy's bad, and he should be doing this and this different," but if you're so good, please be my guest. Pick up the racket and go out there. In tennis, I'm more or less able to say, OK, this person should do this, because I've played tennis for 30 years of my life, and I understand some things. Even then, I could be wrong. But when I have to talk about a politician or a president, it's really not my comfort zone. Is corruption the biggest problem in Russia? I live in Moscow, and Moscow is doing very well compared to most other cities. I feel the biggest problem is not corruption. It's with people. It always lies with people, within a culture. It's a collective effort. If many people are rowing in the wrong direction, the boat will go the wrong way. In general, the majority of people (around the world) are too consumed with greed and doing anything they can to get ahead. They don't have that much respect for anybody else. They're not considerate of others, and you can see that on the road, whether someone sits in the left lane and drives 30 miles an hour and thinks no one should pass them or whether someone is tailgating and trying to pass everybody. All these people have egos, and (when) each one thinks he's the most important person on the planet, you're going to have issues. I like cultures that are more respectful to others. I like cultures that cultivate pride in (one's) work and becoming a better person, a better worker, a samaritan. ... We're all too consumed with "I want this," or "I want that." Not too many people think about what's good for others, what can I do to help someone. I know it's a little like psycho-babble and that sometimes people are too busy making a living and don't want to think about helping somebody else because they can barely feed themselves. But when you always pull the blanket toward yourself, someone's going to get cold. What cultures do you like? I feel like Japanese people are more respectful. I feel like they take pride in their work. When you walk in the street, you feel like it's built for people, generations and the common good. It's not built because, "We're going to make a profit on it today," or because, "The shareholders are going to be happy." Are you concerned or worried about global warming? I think people are going to mess it up way before the global warming. We're constantly having these little wars and these little sanctions on each other. We're trying to separate our little plots of land and saying, "This is mine; this is yours," "No, you keep this," "No, you give it back to me." I'm not sure if the climate is going to finish us off before we finish ourselves. In general, we should not feel we're the owners of the planet. We should feel we're the guests of the planet, and as guests, we should not leave a mess behind ourselves. You make a mess, you clean it up as much as you can. We don't always have that option or have the time or energy to do it, but if guests come to stay at my house, I want them to respect my place. I think we don't do that. Again, we don't think about others. Generally, we just think about:"What's good for me right now, and that's what I'm going to do. The planet is going to be here for another 80 years, and I'm probably going to die in 80 years, so I might as well just turn on my car and idle for the next 20 years (laughs)." Did you get your philosophical outlook from reading Russian classics? Russian classics are generally depressing. In the U.S., all the movies sort of end on a good note. The hero struggles but prevails, and everything is great. In Russia, everyone always dies and everything is miserable, and it ends like that. I don't know if I got it from somewhere, but a lot of things come from analyzing it and thinking about it. In general, if you look at what you're doing and you think, OK, would you like other people to do that to you, how would you feel about it? We just have to be a little bit more considerate. When you consider something other than yourself or don't think of yourself as the middle of the universe and everything revolves around you, if you think of yourself as just part of it, then you start approaching things with a different mindset. It's a process and a journey. I didn't start where I am today, and I'm probably going to finish somewhere else. I'm always evolving. I think everyone has their own little journey. I'm trying to see how can I improve, and I think that's a more exciting way of approaching life. It might not be the easiest, but I think it's more rewarding when you try to improve yourself and help others than when you sit back and say everyone owes me. I'm not saying my way of thinking is right. It could be wrong. It's definitely not the easiest because when you're trying to be a perfectionist in a lot of things, it definitely makes life more difficult. But I can't really change myself that much. 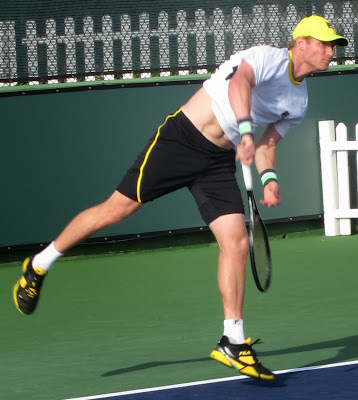 I'll post a three-part Q&A with former top-20 player Dmitry Tursunov, a 34-year-old Russian with strong Northern California ties, next week. Part I -- Tursunov's long history of injuries, the biggest highlight and disappointment of his career, and his plans. Part II -- The Big Four, whether champions are born or made, John McEnroe's provocative comment about Serena Williams, the Margaret Court controversy, equal prize money for men and women, and proposals to speed up matches. Part III -- Russia's doping problem in Olympic sports, its alleged interference in last year's U.S. presidential election, Donald Trump, Vladimir Putin and climate change. No Northern Californians won titles in last week's USTA National Championships for juniors at various sites around the country. 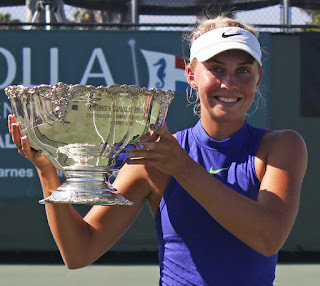 But Ashley Kratzer, the runner-up in last month's $50,000 Stockton Challenger, captured the Girls 18s in San Diego to earn a wild card in the U.S. Open. The year's last Grand Slam tournament is scheduled for Aug. 28-Sept. 10. No. 3 seed Kratzer, an 18-year-old left-hander from Newport Beach, defeated No. 33 Kelly Chen of Cerritos 6-2, 4-6, 6-4 in the final. Newport Beach and Cerritos are in the Los Angeles area. Kratzer eliminated No. 6 Michaela Gordon of Saratoga, located in the San Francisco Bay Area, 7-5, 7-5 in the quarterfinals. Kratzer turned pro late last year. Gordon will enroll at Stanford next month. No. 8 seed Whitney Osuigwe of Bradenton, Fla., defeated No. 17 Katie Volynets of Walnut Creek, Calif., 7-5, 7-6 (3) in the round of 16 in a battle of decorated 15-year-olds. Osuigwe won the French Open junior title in June. Volynets last December became the first girl to win the 16s in the Eddie Herr International Championships and Orange Bowl in the same year. The tournaments were held in consecutive weeks in Bradenton, Fla., on hardcourts and Plantation, Fla., on clay, respectively. In the Boys 18s in Kalamazoo, Mich., No. 1 seed Sam Riffice, who grew up in the Sacramento suburb of Roseville, lost to No. 5 JJ Wolf of Cincinnati 5-7, 6-4, 6-1 in the quarterfinals. Riffice, now based at the USTA National Campus in Orlando, Fla., has verbally committed to the University of Florida for next year. In the Girls 14s in Rome, Ga., No. 1 seed Vivian Ovrootsky of San Jose lost to No. 16 Bridget Stammel of Dallas 6-2, 4-6, 6-2 in the round of 16. Ovrootsky swept the 12s singles and doubles titles at the USTA Winter Nationals in Tucson, Ariz., in January. She turned 13 on July 15. Nathan Perrone, Moorestown, N.J., and Jake Van Emburgh, Belleair Beach, Fla., def. Sam Riffice and Gianni Ross (4), Orlando, Fla., 6-4, 7-5. Oliver Crawford, Spartanburg, S.C., and Patrick Kypson (2), Greenville, N.C., def. Austen Huang, Elk Grove, Calif., and Sean Sculley (12), Hilton Head Island, S.C., 6-4, 6-4. Will Grant, Boca Raton, Fla., and Tyler Zink (3), Bradenton, Fla., def. Robert Cash, New Albany, Ohio, and Ryder Jackson (1), Nicasio, Calif., 6-1, 3-6, 6-1. Andrew Chang (17), Trophy Club, Texas, def. Luke Neal, Mill Valley, 6-2, 7-6 (4). Ben Shelton (17), Gainesville, Fla., def. Luke Casper (10), Santa Cruz, Calif., 6-4, 6-4. Saud Alhogbani (4), Alexandria, Va., def. Hugo Hashimoto (17), San Jose, Calif., 6-4, 6-0. Connor Krug and Jake Krug (1), Lakewood Ranch, Fla., def. Alex Han, Tulsa, Okla., and Hugo Hashimoto (6), San Jose, Calif., 7-5, 7-6 (6). Aidan Kim (1), Milford, Mich., def. Kurt Miller, Los Gatos, Calif., 7-5, 6-2. Lucas Brown, Plano, Texas, and Learner Tien (1), Irvine, Calif., def. Kurt Miller, Los Gatos, Calif., and Andrew Salu (3), Sarasota, Fla., 7-5, 6-3. Angelica Blake (9), Boca Raton, Fla., def. Connie Ma, Dublin, Calif., 6-2, 6-3. Hibah Shaikh, Teaneck, N.J., and Madison Sieg (2), Greenwich, Conn., def. Kimberly Hance, Torrance, Calif., and Yuu Ishikawa (5), Los Altos, Calif., 7-6 (5), 6-2. APTOS, Calif. -- The term "wacky" generally is not associated with professional tennis players. "Serious," sure. "Dedicated," yes. "Resilient," check. But wacky? Not when only 100 men and 100 women on a planet of 7.5 billion people can make a comfortable living in the sport. The 20-year-old Russia native confessed at Wimbledon this year that watching Roger Federer and Rafael Nadal can bore him. "It's interesting to see the highlights, how they're finishing (points), but when they're rallying for, like, 45 shots, you're sitting there thinking, Can I quit tennis please?" Playing Futures tournaments last year, the right-hander sometimes amused himself by hitting only trick shots or drop shots or, with a big lead, playing left-handed. At Indian Wells in March, Bublik interviewed Roger Federer and Andy Murray, among others, as part of a promotion for the inaugural Next Gen Finals, featuring the world's top 21-and-under men, in Milan in November. Bublik to Federer: "How can your hair be so perfect every time?" Federer: "It's not so perfect. It's a battle every day. Grow it out a little bit, and you'll see." Bublik to Murray: "What kind of advice can you give me to be as good as you are?" Murray: "A lot of training ... "
Bublik: "Is that useful, training?" Having graduated to Challengers and some ATP and Grand Slam tournaments this year, Bublik is becoming more serious. 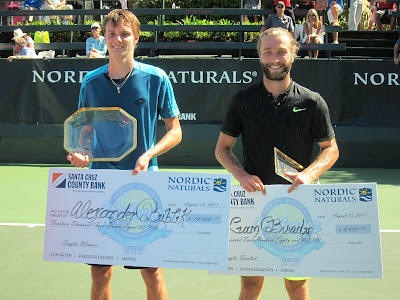 It showed today as he overpowered qualifier Liam Broady of Great Britain 6-2, 6-3 in 62 minutes to win the $100,000 Nordic Naturals Challenger at the Seascape Sports Club. The Challenger, the oldest on the men's circuit in the United States, celebrated its 30th anniversary this year. Past competitors include International Tennis Hall of Famers Patrick Rafter and Michael Chang and future Hall of Famers Murray, Bob Bryan and Mike Bryan. The unseeded Bublik had lost in the quarterfinals and second round of U.S. Challengers in the previous two weeks. "I just decided, OK, let's try to be serious," a bubbly Bublik, who switched his allegiance to Kazakhstan because it offered financial support, said after celebrating his title with a dip in the pool. "I need to find a balance between my jokes and serious tennis, so this week I was quite calm. I didn't mess around that much, so that's why I won the tournament." Broady predicts stardom for Bublik, who stands 6-foot-4 (1.93 meters) and weighs only 165 pounds (75.0 kilograms). "I think he has the potential to go all the way," the affable Broady, a 23-year-old left-hander, said after facing Bublik for the first time. "There's a reason he's ranked (125) already. He's very (flashy), and I'm sure he'll refine his talents as he gets older and gets more experience. He's going to be a scary prospect.
" ... You see the way he's built. He's still not fully grown into his frame yet. He's got six, eight years before he reaches his peak. I don't see why he can't be top 10." Bublik improved to No. 104 in the world with the title, putting him on the verge of direct entry into the U.S. Open, and pocketed $14,400 for his second Challenger singles title. Bublik, who lost to world No. 1 and defending champion Murray 6-1, 6-4, 6-2 in the first round at Wimbledon early last month as a lucky loser, is happy with his progress. "I feel great," he crowed. "It's my first year on tour. Last year I was playing Futures and I started, like, 900 (in the world), so it's been great. I had a rough clay-court season this year, but I'm getting back my rhythm after Wimbledon. The (match) I played with Andy gave me a lot of confidence. I improved a lot after that." There were glimpses of the old Bublik during the week in Aptos. While Dennis Novikov of Milpitas in the San Francisco Bay Area took a medical timeout in Friday's quarterfinals, Bublik entertained himself and the crowd by repeatedly bouncing a ball on the edge of his racket and off both feet. In the final, Bublik frequently hit drop shots and then became whimsical in the last game. Hitting his second serve as hard as his first, he double-faulted three consecutive times to give Broady a break point. "I just said, 'OK, everything or nothing,' " Bublik admitted. Bublik got back to deuce with a service winner, earned his third match point with a backhand volley winner and closed out the match with an ace down the middle. Bublik, who finished with six aces, still likes to have fun on the court. "That's my way of playing," he said. "It's a game. Of course, it's a great sport and you need to work hard, but you need to enjoy every moment of it. Tennis careers are not that (long)." Off the court, Bublik enjoys rap music. He has two Eminem quotes tattooed on his arms: "You won't break me; you just make me stronger than I was," and "Always be a leader and not a follower." Bublik already has beaten two top-20 players, No. 13 Roberto Bautista Agut of Spain and No. 16 Lucas Pouille of France, and it's easy see why. Power. Bublik crushed his serve and groundstrokes against Broady. After the 6-foot (1.83-meter) Broady held for 2-2 in the first set, Bublik reeled off the next seven games to lead 3-0 in the second set. Broady took the next two games, breaking serve for the only time in the match, but Bublik broke right back with a perfect lob. In the next-to-last game, Bublik unleashed a cross-court forehand passing shot so hard that Broady could only flail helplessly at it. "Sasha played really good today," said Broady, who had lost in the first round in Aptos in each of the past two years. "He's obviously got a fantastic serve, which in finals and big moments really helps. I don't think I served as well today as I have during the week. I was a little bit nervous, but that doesn't usually stop me from playing well. It was more Sasha's fault today that I didn't play very well. I'll learn from it and come back stronger." Broady played his seventh match in nine days. "I said to my coach in the quarterfinals I started to feel little bit fatigued," he conceded. "By then, it was my fifth match, so it was like I was making the finals of a tournament. Then the semifinals ... I was a little bit sluggish (today), just one or two percent. "I'd have loved to come out here and been fresh as a daisy, but I think in the finals, no one is ever going to be completely fresh. I gave it the best I could with the situation, and he was too good on the day anyway." Broady became the third British singles finalist, and second to emerge from qualifying, in Aptos in the past two years. Dan Evans beat qualifier Cameron Norrie, who was born in South Africa to British parents and grew up in New Zealand, last year. Also, Scotland's Murray won the Aptos title in 2005 at age 18. Evans, 27, faces a suspension of up to four years after testing positive for cocaine in April. Broady, who fell to 0-2 in Challenger finals, jumped from No. 336 to No. 256 and collected $8,480. He's fighting his way back after climbing to a career-high No. 158 two years ago at age 21. "I was saying this to a friend the other day: I didn't really know why I got to (158)," mused Broady, whose older sister, 6-foot-2 (1.89-meter) Naomi, is ranked No. 127 after reaching a career-high No. 76 last year in March. "I was quite young, just playing tennis and playing well. I was on a wave of confidence, and before I knew it, the results stopped coming a little bit, and I didn't really know how to get them back. "I split from my coach (David Sammel) and didn't have one for about nine months. I just did what any young guy would do. I enjoyed myself and went out with my friends. I played tennis to the best of my ability, but I had no direction. "As I'm sure anyone can relate in any walk of life, it's very difficult to do things when you have no direction, but I called my coach at the end of November last year and said, 'Look, I want to sort things out. I'm hungry; I want to play tennis again.' I hope we're going to start seeing dividends for the last eight months of hard work." Broady's countryman, Neal Skupski, teamed with Jonathan Erlich of Israel to win the doubles title in their first tournament together. Seeded third, they edged fourth-seeded Alex Bolt and Jordan Thompson of Australia 6-3, 2-6 [10-8]. On the last point, Bolt and Thompson had a sitter in the middle of the court at the service line but let the ball go between them for a winner. Both Erlich, 40, and Skupski, 27, said they had never had a match end that way. "We don't mind," Skupski cracked. "We're happy with the result." Erlich and Skupski, who split $6,200, saved five match points combined in the quarterfinals and semifinals. 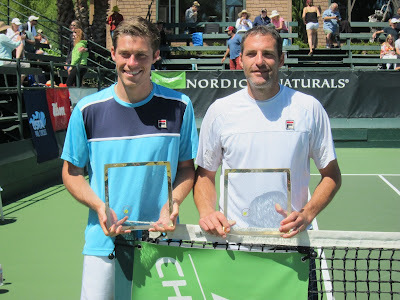 Erlich also paired with countryman Andy Ram to win the Aptos Challenger in 2013 and the Australian Open in 2008. Here are the complete Nordic Naturals Challenger singles and doubles draws. 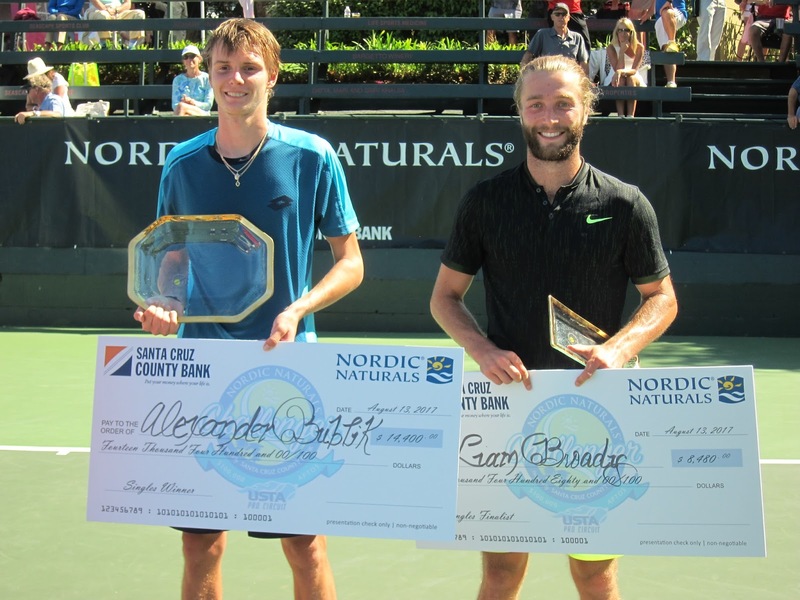 Qualifier Liam Broady of Great Britain upset wild card Taylor Fritz, a top U.S. prospect, 7-6 (3), 6-3 today to reach the final of the $100,000 Nordic Naturals Challenger in Aptos, Calif. Throughout the match at the Seascape Sports Club near the Pacific Ocean, the 23-year-old Broady served his way out of trouble and outsteadied the 19-year-old Fritz from the backcourt. Broady, a 6-foot (1.83-meter) left-hander, won 84 percent of the points on his first serve (41 of 49) and saved all six break points against him. Fritz is ranked No. 131, down from a career-high No. 53 one year ago. Broady is No. 336 after climbing as high as No. 158 two years ago. Broady is the third British finalist, and second to emerge from qualifying, in Aptos in the past two years. Dan Evans defeated qualifier Cameron Norrie, a South Africa native, last year. Also, current world No. 1 Andy Murray of Scotland won the Aptos title in 2005 at age 18. Broady's older sister, 6-foot-2 (1.89-meter) Naomi, is ranked No. 127 after reaching a career-high No. 76 in March last year. Liam Broady will face Alexander Bublik, who was born in Russia but changed his allegiance to Kazakhstan after being offered financial support, for the first time on Sunday after the 1 p.m. doubles final. The matches will be streamed live. Bublik, 20, defeated Sam Groth, a 29-year-old Australian with a booming serve, 7-6 (2), 6-3. The 6-foot-4 (1.93-meter), 165-pound (75-kilogram) Bublik won 82 percent of the points on his first serve (31 of 38). Groth set an unofficial record with a 163.7-mph (263.4-kph) serve in the 2012 Busan (South Korea) Challenger. Bublik already has beaten two top-20 players in his career: No. 13 Roberto Bautista Agut of Spain to reach the quarterfinals in Moscow on the ATP World Tour last October and No. 16 Lucas Pouille of France in the first round of the Australian Open in January as a qualifier. Both Bublik, ranked No. 125, and Broady will play in their second Challenger singles final. Bublik won a $50,000 hardcourt tournament in Morelos, Mexico, in February. Broady was the runner-up in Charlottesville, Va., also a $50,000 hardcourt tourney, in 2014. The Aptos Challenger, the oldest on the men's circuit in the United States, is celebrating its 30th anniversary. Past competitors include International Tennis Hall of Famers Patrick Rafter and Michael Chang, as well as future Hall of Famers Murray, Bob Bryan and Mike Bryan. Here are the Nordic Naturals singles and doubles draws and Sunday's schedule. on Center Court in Aptos, Calif., on Wednesday. Wild card Taylor Fritz, one of the United States' top prospects, defeated sixth-seeded Tennys Sandgren of Gallatin, Tenn., 6-5, 7-6 (1) today in the quarterfinals of the $100,000 Nordic Naturals Challenger at the Seascape Sports Club in Aptos, Calif.
Fritz, 19, of Palos Verdes in the Los Angeles area, saved three sets points while serving at 5-6 in the second set. Fritz made his Challenger debut two years ago in Aptos, losing to veteran Mischa Zverev, now ranked 26th, in the first round. Two months later, Fritz won the Sacramento and Fairfield Challengers, also in Northern California, back to-back at 17. He became the second-fastest American man to reach an ATP World Tour final last year at Memphis and stunned then-No. 7 Marin Cilic, the 2014 U.S. Open champion, at Indian Wells in March. Ranked a career-high No. 53 one year ago, Fritz has tumbled to No. 131 because of knee problems. Fritz's mother (Kathy May), father (Guy Fritz) and uncle (Harry Fritz) all played professionally. May peaked at No. 10 in the world in 1977 and played in three career Grand Slam quarterfinals. Taylor Fritz will meet qualifier Liam Broady of Great Britain in today's second semifinal. Broady, a 23-year-old left-hander, beat Raymond Sarmiento of Los Angeles 6-4, 6-4. Sarmiento, a 25-year-old former USC All-American, played in the Aptos quarterfinals for the second consecutive year. In the first semifinal, which will follow an 11 a.m. doubles semi, Alexander Bublik of Kazakhstan will face Sam Groth of Australia. Bublik, a 20-year-old Russia native, eliminated wild card Dennis Novikov of Milpitas in the San Francisco Bay Area 6-1, 6-4 in 64 minutes. Milpitas is a one-hour drive north of Aptos. Bublik, 6-foot-4 (1.93 meters) and only 165 pounds (75 kilograms), qualified for the Australian Open and Wimbledon this year. He shocked France's Lucas Pouille, then ranked 16th, in the first round in Melbourne before losing to Malek Jaziri of Tunisia. Bublik fell to top-ranked Andy Murray 6-1, 6-4, 6-2 in the opening round at Wimbledon. Groth held off countryman Akira Santillan, a 20-year-old Tokyo native, 7-5, 7-6 (4). Groth pounded 17 aces, and Santillan had 15. Groth, 29, set an unofficial record with a 163.7-mph (263.4-kph) serve in the 2012 Busan (South Korea) Challenger and climbed to a career-high No. 53 in 2015. Both semifinals will be first-time meetings. The Aptos tournament, the oldest men's Challenger in the United States, is celebrating its 30th anniversary this year. Past competitors include International Tennis Hall of Famers Patrick Rafter and Michael Chang, as well as future Hall of Famers Andy Murray, Bob Bryan and Mike Bryan. 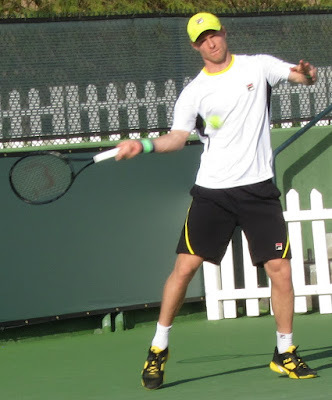 Dennis Novikov, playing near home, upset fifth-seeded Mikhail Kukushkin of Kazakhstan 6-7 (3), 7-6 (3), 6-3 in 2 hours, 40 minutes today to reach the quarterfinals of the $100,000 Nordic Naturals Challenger in Aptos, Calif.
Novikov, a 23-year-old wild card from Milpitas in the San Francisco Bay Area, converted only 42 percent of his first serves but saved 12 of 13 break points against him at the Seascape Sports Club. Milpitas is a one-hour drive north of Aptos. Novikov, who reached his first ATP World Tour quarterfinal last month on grass in Newport, R.I., will play another Kazakh, Alexander Bublik, on Friday at 11 a.m. It will be the first match between Bublik, ranked No. 125, and Novikov, ranked No. 216. Bublik, 20, routed third-seeded Henri Laaksonen of Switzerland 6-1, 6-1 in 45 minutes. Both Bublik and Kukushkin were born in Russia. Bublik, 6-foot-4 (1.93 meters) and only 165 pounds (75 kilograms), qualified for the Australian Open and Wimbledon this year. He stunned France's Lucas Pouille, then ranked 16th, in the first round in Melbourne before losing to Malek Jaziri of Tunisia. Bublik fell to top-ranked Andy Murray 6-1, 6-4, 6-2 in the opening round at Wimbledon. Only one seed reached the Aptos quarterfinals. No. 6 Tennys Sandgren will face wild card Taylor Fritz for the first time in an all-American showdown not before 6 p.m.
Sandgren, 26, played in the main draw of a Grand Slam tournament for the first time in May. He lost to Kukushkin in the first round of the French Open. Fritz, 19, shocked Marin Cilic, the 2014 U.S. Open champion, at Indian Wells in March. Cilic was ranked seventh at the time. In Friday's other quarterfinals, Raymond Sarmiento of Los Angeles will play qualifier Liam Broady of Great Britain not before 1:30 p.m., and Sam Groth will take on fellow Australian Akira Santillan not before 4 p.m.
Sarmiento, a 25-year-old former USC All-American and a quarterfinalist in Aptos last year, will try to reach a Challenger semifinal for the second consecutive week. He lost to eventual champion Michael Mmoh, a 19-year-old American, in three sets in Lexington, Ky., last week. Groth, 29, set an unofficial record with a 163.7-mph (263.4-kph) serve in the 2012 Busan (South Korea) Challenger and climbed to a career-high No. 53 in 2015. Santillan, a 20-year-old Tokyo native, won his first Challenger title last month in Winnetka, Ill. The Aptos tournament, the oldest men's Challenger in the United States, is celebrating its 30th anniversary this year. Past competitors include International Tennis Hall of Famers Patrick Rafter and Michael Chang, as well as future Hall of Famer Andy Murray, Tommy Haas, James Blake, John Isner, Milos Raonic, Sam Querrey, Steve Johnson, Jack Sock, Bob and Mike Bryan, Mardy Fish, Marcos Baghdatis and Radek Stepanek. Here are the Nordic Naturals Challenger singles and doubles draws and Friday's schedule. Live streaming is available.